[Image: A “garden suburb” outside Moscow. Via Cabinet Magazine]. Without getting into specifics – for that, be sure to pick up a copy of the magazine, issue #24 – one detail about the garden suburb that I particularly love, and that the article’s author specifically highlights, was a sort of colosseum of slumber. A dream academy. 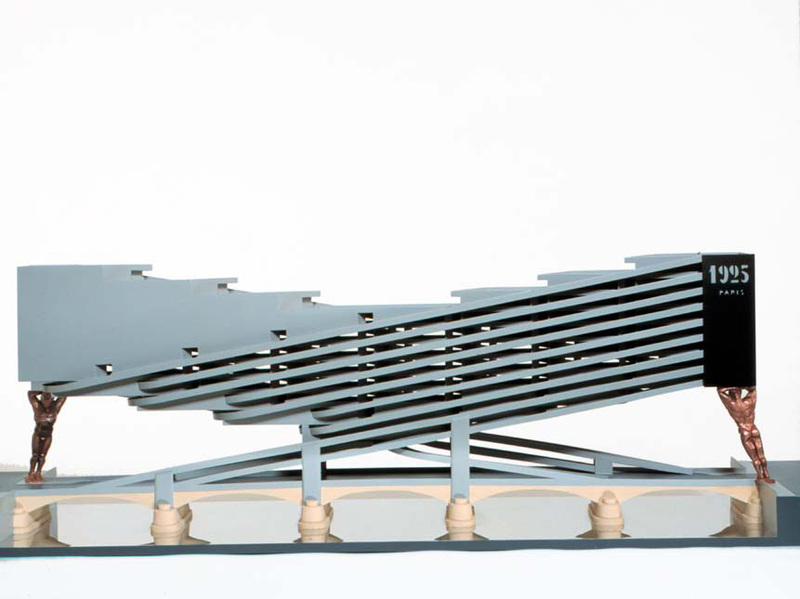 [Image: Konstantin Melnikov’s “Sonata of Sleep.” Via Cabinet Magazine]. At either end of the long buildings were to be situated control booths, where technicians would command instruments to regulate the temperature, humidity, and air pressure, as well as to waft salubrious scents and “rarefied condensed air” through the halls. Nor would sound be left unorganized. Specialists working “according to scientific facts” would transmit from the control centre a range of sounds gauged to intensify the process of slumber. The rustle of leaves, the cooing of nightingales, or the soft murmur of waves would instantly relax the most overwrought veteran of the metropolis. Should these fail, the mechanized beds would then begin gently to rock until consciousness was lost. His original dream had been to create an Institute for Changing the Form of Man. 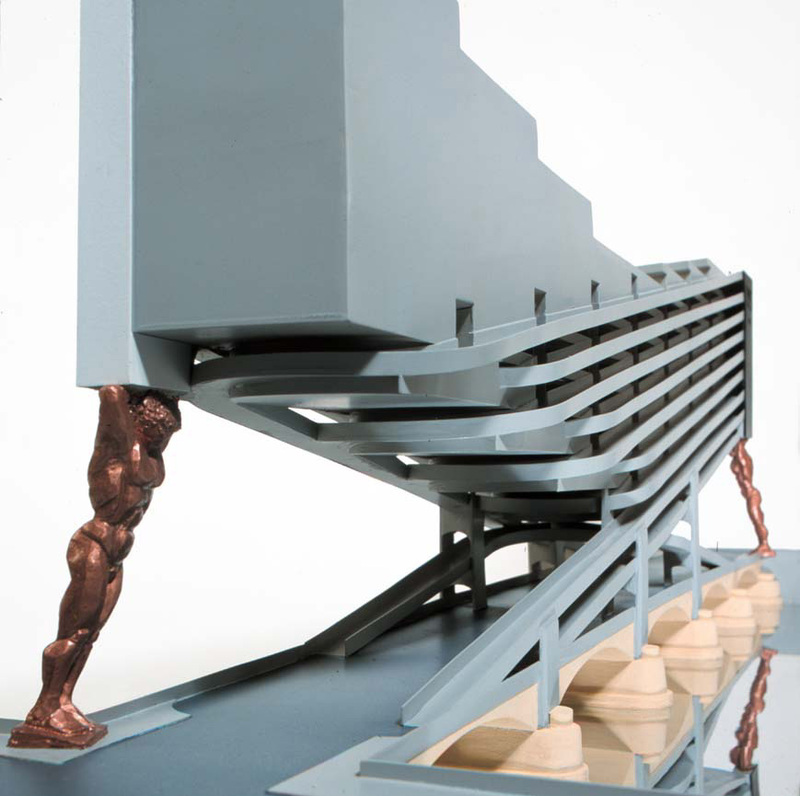 [Image: Konstantin Melnikov’s “Leningrad Pravda” tower, as modelled by R. Notrott]. While I’m on the subject, though, don’t miss this page full of Melnikov’s other architectural projects, including the tower, pictured above, where “each floor should turn around the central core,” and this outrageous parking garage, to be constructed as a bridge in Paris, over the Seine. Note the bronze, Oscar-like statues holding up either end of the structure. (Thanks to Leah Beeferman for emailing me the first two images, hot off the press from Cabinet). This reminds me of Tatlin’s Monument to the Third International, also never built. In fact, come to think of it, were any of those ambitious architectural projects of the early USSR ever implemented? I suppose a central planning arrangement aimed at efficient processing of projects would make difficult any effort at unique or specialized development. There are these caged, spiral staircases of the 110 that look a lot like those tower thingies. The Sonata of Sleep building is wild, reminds me of the Art Center College of Design in California.